This collection of meditations covers various themes pertinent to the formation, life, and ministry of the ordained priest. Order both Volumes I and II for a discounted price. This collection of meditations covers various themes pertinent to the formation, life, and ministry of the ordained priest. Each theme is one aspect of a common, unifying vision: priestly conformity to the Crucified Christ. Through the Sacrament of Holy Orders, the priest--in the depths of his being--is sacramentally conformed to Christ the Head. Truly, he can say with Saint Paul: “I have been crucified with Christ; it is no longer I who live, but Christ who lives in me” (Gal 2: 20). 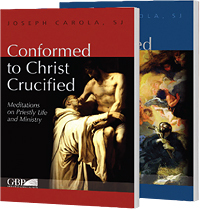 This book calls both the seminarian who seeks ordination and the priest already ordained to embrace wholeheartedly the cruciform reality of the priestly vocation: to be made one with the risen Christ Crucified for God’s greater glory and the salvation of souls.